First a lesson in MINI product codes, just so we’re all clear about this. 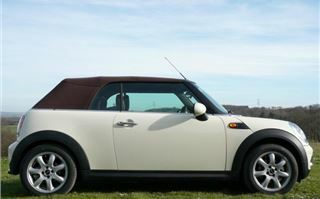 The first BMW MINI was coded R50, followed by the R52 convertible, while the Cooper S was designated R53. The second generation MINI hatchback is the R56. 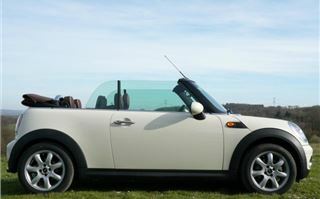 The Clubman version is the R55. 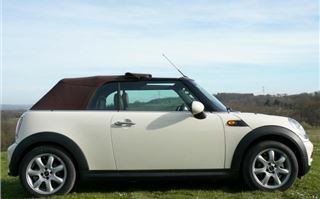 And the new convertible is the R57. 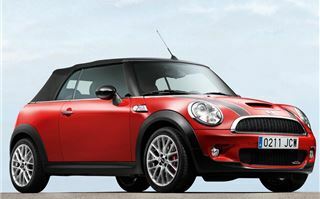 Apart from the completely different range of engines and transmissions and new suspension, the main benefit of the R57 MINI Convertible over the R52 is a 10% stiffer structure. This is very important in a convertible with no roof to stop it twisting over speed cushions. And, in the case of the R57 MINI convertible, completely eliminates the dreaded ‘scuttle shake’. The other benefit, of course, is enabling the suspension to do its job properly without being compromised by a writhing frame. And because the MINI engineers have done such a good job, they saw no reason not to offer a full 211PS John Cooper Works version of the new convertible. The best place to test that, of course, was a race track. 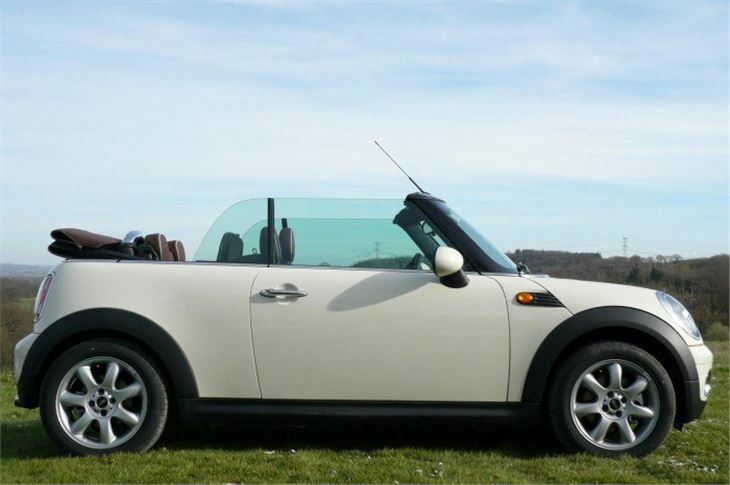 While the obvious place to test the 120PS MINI Cooper convertible was the road, happily during a pair of March days blessed with some sunshine and 20 degree plus temperatures. It’s worth mentioning here that all MINIs now come with stop-start, a system that shuts off the engine when the car is stopped for more than 5 seconds, and automatically re-starts it as soon as the driver depresses the clutch. This pulls the CO2 emissions down quite a bit in the official EC tests, putting the R57 convertible in much more tax friendly VED and BIK bands than the R52. You also get standard aircon in all versions of the convertible. So, though buyers spend an average of £3,000 accessorising their MINIs, you now get the basic essentials even in the base models. 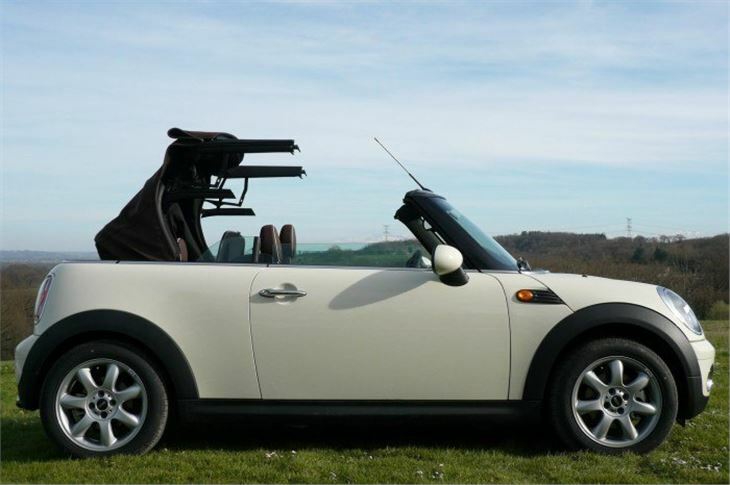 The electric canvas roof of the new MINI Convertible can be fully retracted or closed using the upper switch pack mounted toggle in just 15 seconds. In the event of a driver being caught unexpectedly by a sudden downpour, the top will go back up while driving at speeds of up to 20 mph, though it’s obviously best not to try this in any strength of wind. 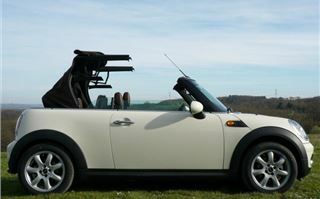 As an alternative to taking the whole top down the front part of the roof can also be retracted to create the effect of a sunroof. This can be operated at speeds of up to 75 mph. One of the more frivolous accessories is the ‘openometer’ a gauge beside the steering wheel that logs how long you have driven the car with the top down. I managed to clock up a creditable four hours over 250 kilometres in no discomfort at all. 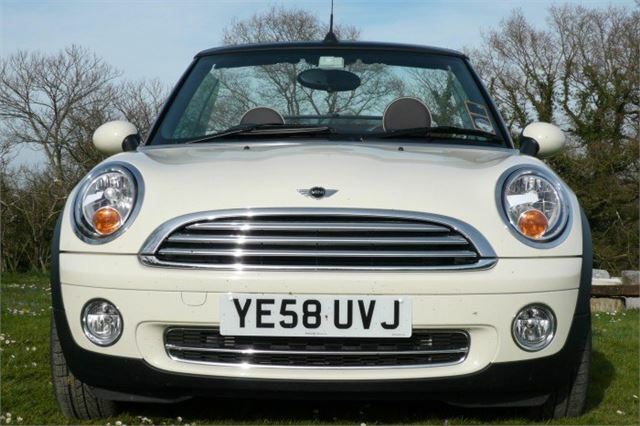 The 120PS Cooper doesn’t have a lot of grunt, of course. It would be nicer with the 150PS turbocharged version of its engine, as used in Peugeots. 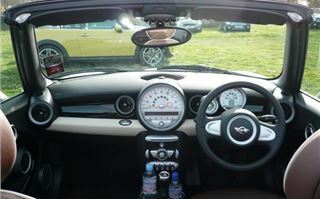 There’s no real need to go to the more aggressive 175PS of the MINI Cooper S convertible, which I didn’t drive. Though it’s worth noting that you can have a 6-speed Aisin Warner automatic transmission with both the Cooper and the Cooper S, with optional paddleshifters if you wish. 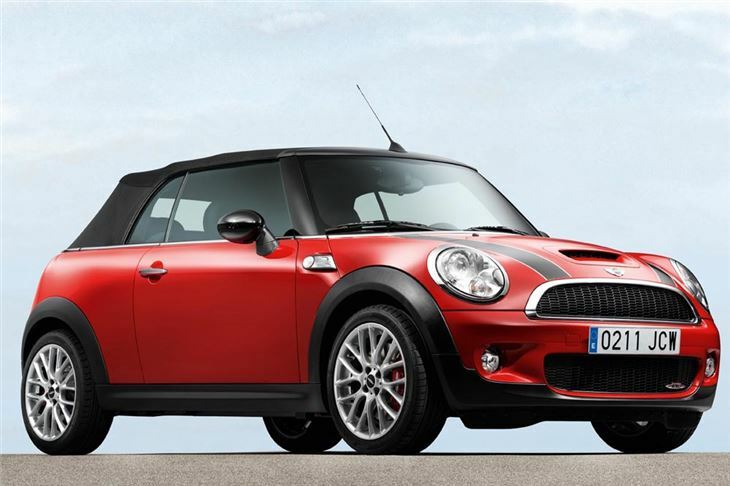 If you want to go berserk, of course, then your obvious choice is the 211PS MINI Cooper S John Cooper Works convertible that pulls 60 in 6.6 seconds and will likely pull your hat off at its top speed of 146mph. That car was huge fun on the Pau Arnos circuit and safe even with the Sport button pressed and the DSC turned off (though, as with the JCW hatchback, I don’t advise turning DSC off on the road). 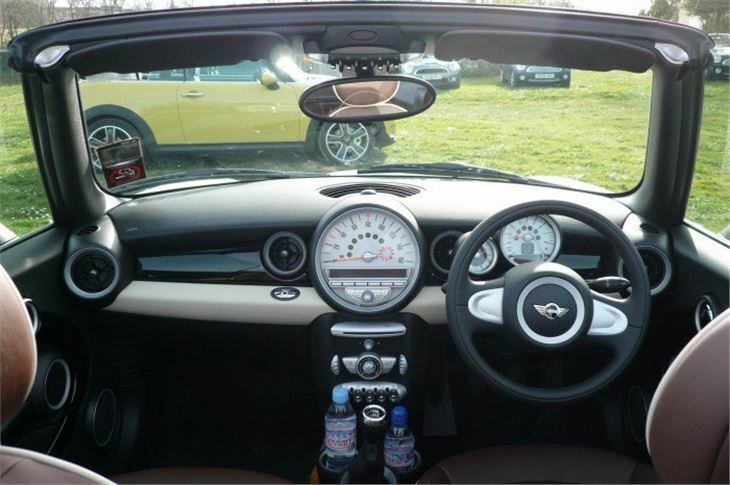 Even with everything off, its handling is obviously more sophisticated than an original Mini’s. But it does the job in a similar way, gripping like mad, then eventually understeering in a completely controllable manner that allows you to back off and get back on line (providing, of course, you’re not going far too quickly). You could run one as a fun daily driver and indulge in the occasional track day even in the convertible JCW. All the questionmarks we had over the steering of the original R56 MINI Cooper and Cooper S have been answered. 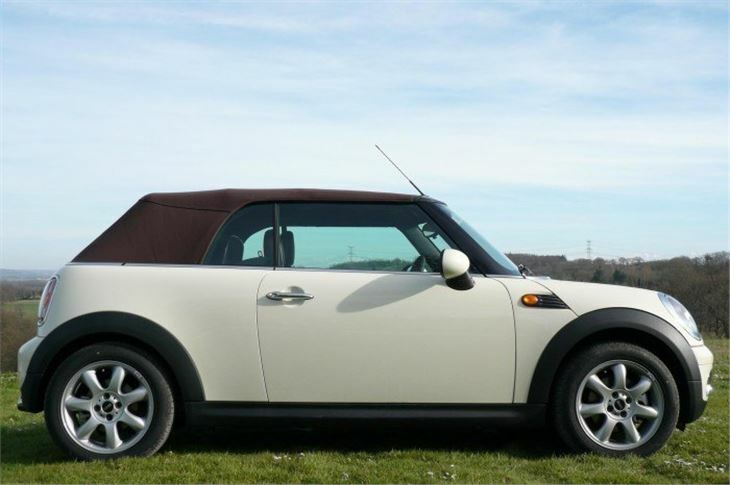 As you can see from the photos and the video, I particularly liked the new MINI convertible in Pepper White with Hot Chocolate Brown trim, a colour combination that also suits the Peugeot 207CC best, but which I found so appealing on the MINI that I actually want one. The girl next door definitely does.